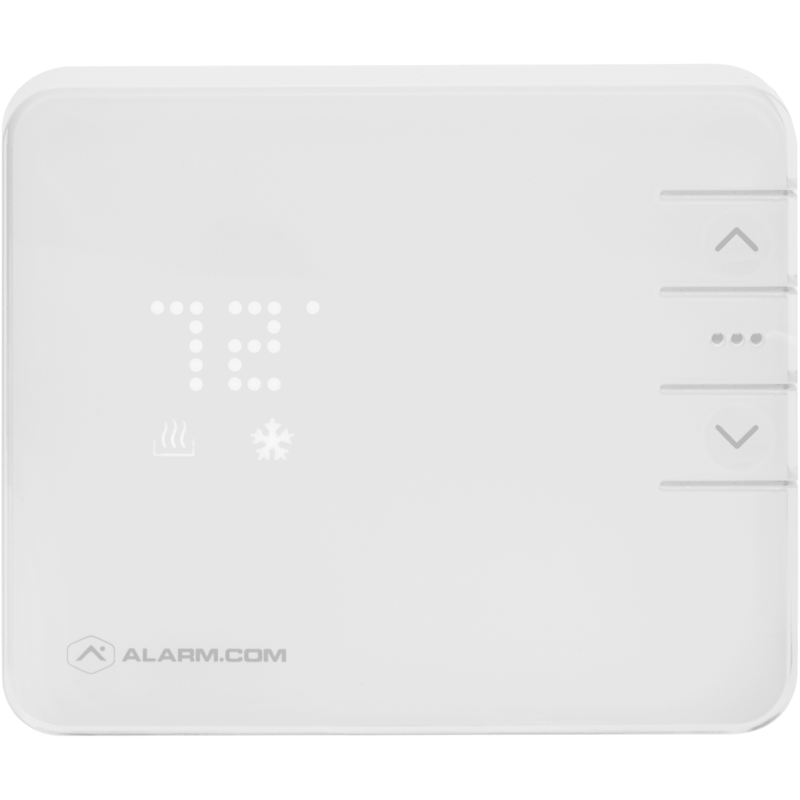 The Alarm.com ADC-T2000 is an aesthetically pleasing smart thermostat. The ADC-T2000 combines streamlined hardware, sophisticated cloud services, and an ecosystem of connected devices for an uncompromising energy management solution. Finally, DIYer's have the ultimate level of comfort that they can't get anywhere else. The ADC-T2000 is designed for easy installation, smart configuration and remote support. Precision Comfort: With custom schedules, temperature presets and broad system capability, its easy to always have theoptimal temperature. Custom Schedules automatically adjust thermostat settings based on day, time and temperature. Temperature Presets (Home, Away, Sleep) make it easy to maintain the ideal temperature around the home. Integration with multi-stage heating and cooling systems enables more accurate temperature control. Responsive Savings: Data from inside and outside the home allows our thermostat to automatically respond to activity, occupancy and weather patterns. Geo-Services, location-based automation rules, trigger adjustments for savings when the family is away from home. Extreme Temps feature automatically adjusts on extremely hot or cold days to reduce energy costs. Integration with leading utility software platforms enables instant eligibility and easy enrollment for reduced rates, rebates and savings. Intelligently Connected: Our thermostat seamlessly integrates with devices across the Smart Home for an integrated user experience. Activity from devices and sensors around the home is captured to make better decisions and more accurately optimize savings and comfort for the individual household. Triggered Automations allow the thermostat to respond automatically to other devices like the security system or door locks. One, integrated mobile app makes the Alarm.com Smart Thermostat part of a seamless Smart Home experience. Complete Control: DIYer's can now adjust thermostat settings anytime from anywhere, and instantly know if someone else makes a change. Remotely change the temperature, turn on/off schedules, or set to away mode for extended savings. Get an alert if someone changes the temperature, or if the home's temperature is unexpectedly high or low. Limit temperature control to certain users or within certain temperature thresholds. Smart Configuration: The new configuration wizard on MobileTech enables a fast and accurate installation experience. Broad HVAC Compatibility: Works with almost any heating and cooling system, including up to 3 stages of heat and two stages of cooling, multiple zones, heat pumps, and dual fuel systems. Screwless Terminals: Easy wiring connections without additional equipment. Flexible Power Options: Unlike most thermostats, the Alarm.com Smart Thermostat can operate on AA batteries for up to 18 months or can be connected directly to a common wire. Remote Support: All device settings can be monitored and adjusted through Alarm.com's AirFXTM for instant and easy remote support. Communications: Z-Wave radio connects to communications module in all Alarm.com supported security panels.